This section contains the lowest pitched instruments in the steel pan family. They play the bass lines which provide the harmonic foundation for the steelband (steel drum band). There are many members in this section but only the more common types are mentioned. Although the pan has two definate pitches, its function is essentially rhythmic, as it is used to play simple bass lines with repeated rhythmic figures. A single pan with four notes played by one person. It provides the bass lines for single pan bands. Also called the four bass. 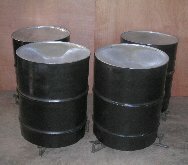 It consists of four drums which are played by one person and are used in conventional steelbands. They provide the definition in the section and play a crucial role in producing clean, unambiguous bass lines. 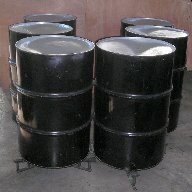 Six drums played by one person, used in conventional steelbands.